When I plan a trip, my first considerations after lodging accommodations are food destinations; restaurants, bakeries, farmers markets, wineries, you get the idea~ My family and I recently decided to go on a long weekend trip to Asheville, NC, my foodie search began. My trusty “Fodor’s Guide” and “exploreasheville.com” were my first search resources. Then purely by accident, while checking out other food blogs, I hit the jackpot. A handful of food bloggers (The Humble Gourmand, The Food Geek, Running with Tweezers, White on Rice Couple, Steamy Kitchen and Tartelette) had just posted about their trip to Asheville. My list of food destinations quickly grew and narrowed at the same time. I thought I would share the highlights from my food focused trip. 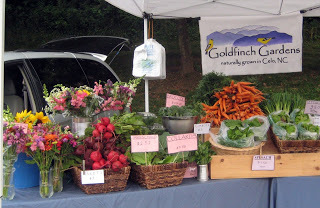 My Top 10 Food Highlights from Asheville, NC and surrounding vicinity. 1. 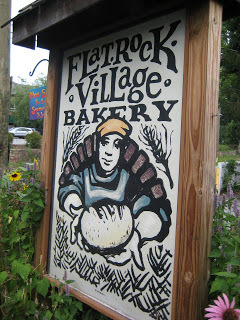 Flatrock Village Bakery, 2710 Greenville Hwy, Flat Rock The BEST wood-fired pizza I ever had- 4 cheese pizza with a thin crust. Causal and homey atmosphere- I can’t get their squash gratin out of my mind. 4. Saturday Morning Asheville City Market, 161 S. Charlotte St. 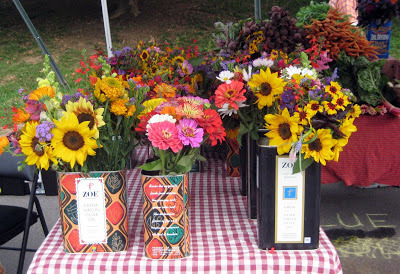 The sights and smells are ingredients of inspiration- I love farmers markets. 5. Farm & Sparrow Bakery@ City Market http://farmandsparrow.com Artisan breads and treats, I made my lunch with a seasonal vegetable focaccia. 6. Spinning Spider Creamery @ City Market http://spinningspidercreamery.com Fresh Chevre with Fig, Rosemary and Honey simply heavenly. They also offer cheese making classes, just add your own goats. Referred by a local, who called it a “dive” with gourmet food. Not promising from the outside, but walking to our table inspecting the other diners’ plates, I knew I was in for a fresh tasty dinner. I had ravioli with duck sausage. One of my best dinners in Asheville. What can I say, my family & I love chocolate and this is a chocolate temple with comfy couches for savoring your chocolate fix on. Creative southern style cuisine focusing and emphasizing local ingredients. I had fried green tomatoes on goat cheese grits and fresh local trout. My selection, the “breakfast special”- Smoked Salmon Souffle with a fresh green salad. I discovered I love salad for breakfast! Okay, it did end up to be a food centered vacation. At least that is how I fondly remember my trip to Asheville. Thank goodness we did some hiking in the Smoky Mountains and white water rafting down the French Broad River to balance all that eating. A vacation with great food always motivates me to come home and try to re- create some of those food memories. Zucchini is currently bountiful in the garden and it has been rather rainy here lately so, Zucchini Gratin is the perfect vacation memory (from the Early Girl Eatery) + comfort food on a rainy day. 1. Cut zucchini in thin slices at a diagonal. 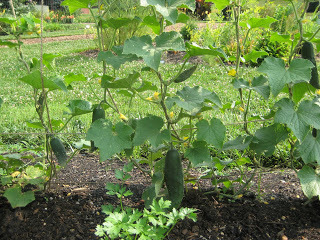 In a large bowl, gently toss the zucchini with 1 teaspoon of kosher salt and let sit for 10 minutes. 2. Heat the butter in a medium size frying pan until completely melted. Take off the heat and sprinkle the breadcrumbs into the butter, mixing with a spatula. 3. Drain the zucchini slices and towel off excess moisture. In a large bowl mix zucchini, garlic, thyme, 1/2 cup salsa verde and pepper. Add the cheese and half the butter coated breadcrumbs and mix completely. 4. 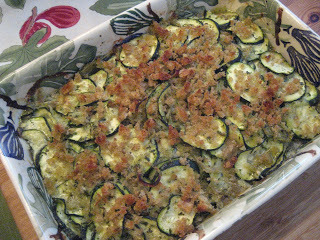 Place the zucchini mixture in a buttered 8 x 10 gratin dish. Sprinkle the remaining buttered breadcrumbs on the top. Bake about 40 minutes until tender and golden on the top. Combine oregano, mint, and parsley in the bowl of a Cuisinart. Add about 1/4 of the olive oil, process with the pulse button. Add garlic and capers, pulse to combine. Gradually add remaining olive oil and lemon juice to form a paste like consistency. Add salt and pepper to taste.